The Coppola triplets did what Coppolas do. They played football. 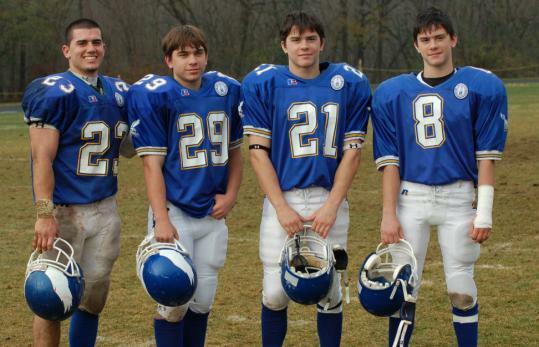 Like their father, Skip, a former quarterback at Pope John High School in Everett, and older brother, Derek, a running back at the University of New Hampshire, the North Reading triplets played a violent sport because they loved it. All three were on the fast track a year ago to playing big roles this fall for the powerhouse football team at St. John’s Prep in Danvers. Then, it was as if lightning struck the same house twice. Brandon Coppola was the first to fall, cracking a vertebra in his neck last October during a junior varsity game, ending his football career. Then, three weeks ago Friday, Jared crumpled after making a tackle during a varsity scrimmage in Lynn. He critically injured the same vertebra, C5, leaving much of his body paralyzed, suspending life as he knew it.